HTML is the predominant programming language used to create Web pages. 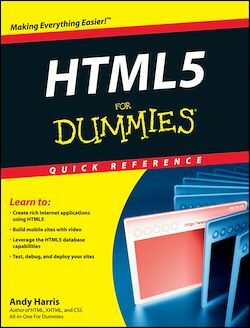 HTML5 has enhanced rich media, geolocation, database and mobile capabilities, and is now able to script APIs, making it a must-have for Web developers. This convenient reference, comb-bound to lie flat, makes it easy to find the information you need in a hurry so you can get those terrific Web pages designed and online right now.